ECO News – In Eagle County, Colorado this Week! The ECT would like to thank all concerned members of our Community – who took time away from their schedules to participate in this years Community Pride (orange bag) Highway Clean up. 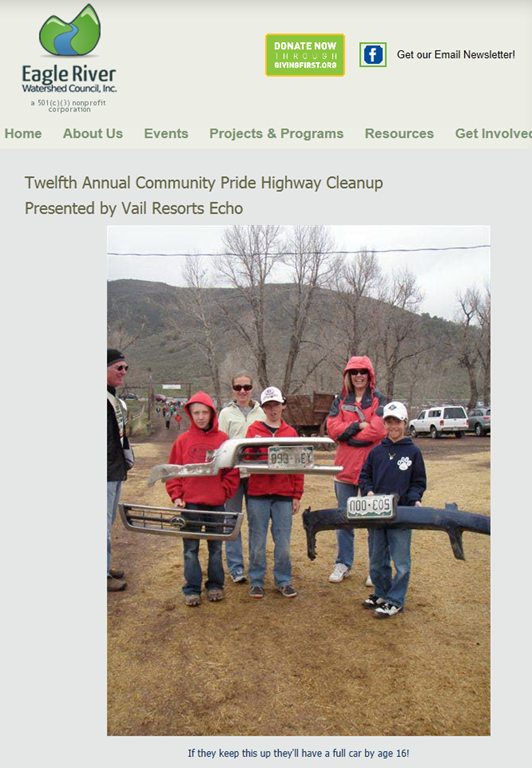 The ECT thought that we’d take one of the recent photos from our local Eagle River Watershed Council 501(c)3 non-profit web page to help make the ECT’s point this week. Frankly, the ECT folks…are not favorably impressed with the (blind eye) that seems to be a hallmark at the so called “Watershed Council”. 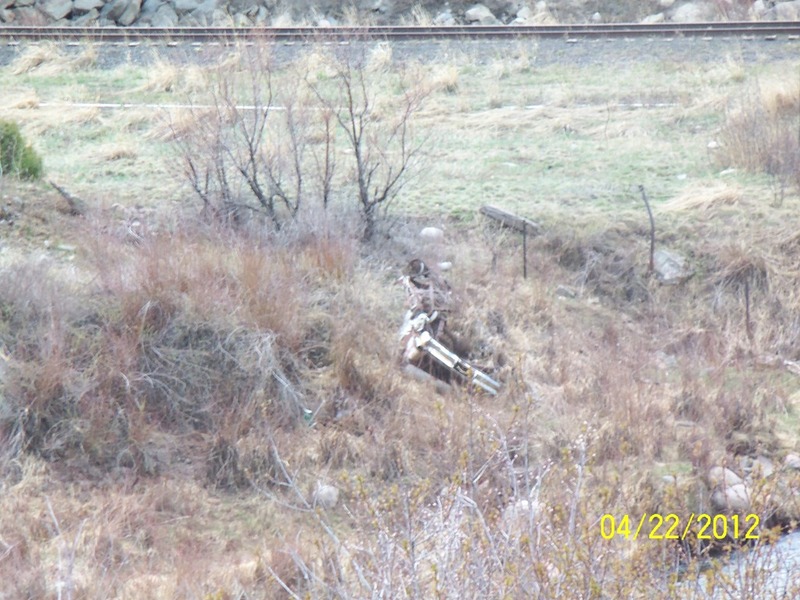 Well…the ECT folks know where these youngsters can get a few more car parts…that would be at the Junction of the Eagle River and Gore Creek – at Dowd Junction…This car can easily be seen from the paved bike path that bikers use riding through Dowd Junction. Last year just before their annual River clean up the ECT folks posted a photograph of this abandoned car to the Watershed Council’s Facebook page. To the ECT’s dismay – our photo, and our point to the Watershed Council was and is still being ignored. The Junk car is still sitting on the River Bank…leaking (who knows what?) into our Watershed. Below from last years ECT report on this non-profit. Note the dates on the photos, please. The ECT folks look forward to the day when we can report that this Junk car has been removed from the banks of our Communities Watershed! For a complete copy of the ECT’s story from last year (Click Here) Please add your voice to the voice of the ECT – on the Watershed Council’s Facebook page (Click Here) – ASKING…when will this Junk car be removed from our Watershed! Thanks ECT. Sounds like just another say one thing and do another non-profit. 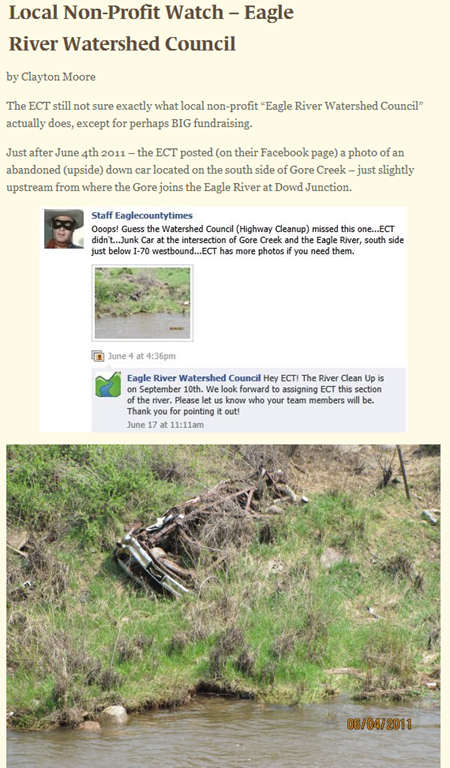 What does the ERWC contact CDOT or whoever and help remove that car from the side of the riverbank. There are plenty of other non-profits that will get my dollars before I send this group anymore funding. Thanks for staying on this story ECT. Folks need to know the truth. Your pictures is worth a thousand words.